The Golden Age of la canzone napoletana was around the turn of the century (that is, the years between the 1890s an 1910s) and many of the best-loved songs found their way abroad on the lips of the millions of emigrants who left their home. Many of them were from Naples, which explains—along with the infectious charm of the music, itself—why it was this music that became synonymous with Italy all over the world. The great Italian tenor, Enrico Caruso, was from Naples, and in America, besides his normal operatic repertoire, he recorded many of these songs for RCA and even sang them frequently as encores after a performance at the Metropolitan Opera in New York. But, whether you're singing an exuberant tarantella or bewailing your lost homeland in the immigrant tear-jerker, Lacreme napulitane, you have to sing correctly—that is, in the Neapolitan dialect. This means that "Napoli" becomes "Napule" and "Sorrento" "Surriento". And don't forget the retroflex "l" and reduced final vowels. Even another great Italian tenor, Luciano Pavarotti, evokes a good-natured wince or two down in these parts when he wraps his Northern vowel sounds around 'O sole mio. Here is a short audio excerpt from the "immigrant tearjerker" mentioned in the above paragraph. It is the best-known of all songs of the so-called Neapolitan Diaspora (see entry at emigration/immigration). Lacreme napuletana was composed in 1925, text by Libero Bovio, music by Francesco Buongiovanni. The title means "Neapolitan Tears"; the text is in the form of a letter written home from America to Naples at Christmas by an immigrant. The excerpt starts on the refrain that "everyone knows"--a startlingly oriental melodic phrase with the text, "How many tears America has cost us...". It is performed here by Roberto Murolo, the greatest scholar of the Neapolitan Song in the 20th century and one of the greatest interpreters. There are a few bizarre sidelights to this phenomenon of the Neapolitan Song: the pseudo-Neapolitan Song generated abroad, for example. Some years ago, one Dino Crocetti (aka Dean Martin) unleashed a monstrosity called That's Amore. Don't fail to miss that immortal first line: "When the moon hits your eye like a big pizza pie, that's amore." Another line contains perhaps the most execrable rhyme ever penned: "drool /fasule " (Neapolitan for fagioli—beans). True to the prediction implicit in H.L. Mencken's jibe that no one ever went broke underestimating the taste of the American public, Dino had a smash hit on his hands. Oh, well. Another "oh, well" for Elvis Presley and the lyric, "It's now or never," sung to the melody of 'O sole mio. It is not clear whether this version confused or amused the ultimate arbiters of the canzone napoletana, the Neapolitans, themselves. Who knows? One of them, Eduardo di Capua (1864-1917), the composer of 'O sole mio, might even have been delighted, just as he undoubtedly is when he looks down and sees men rowing legions of Americans, British, Japanese and Germans along the lagoon beneath the cold and grey skies of Venice and praising to them the glorious sun of Naples — for, yes, the mayor of Venice finally had to give in. Ha! 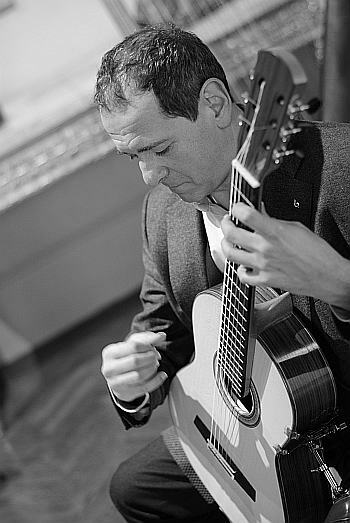 First, Antonio Grande is a prominent Neapolitan classical guitarist. He was born in 1960 and graduated with a degree in composition and guitar performance from the “S. Pietro a Majella” music conservatory in Naples; he currently gives master classes and teaches guitar at the “Giuseppe Martucci” music conservatory in Salerno. He has traveled widely to international events throughout Europe and Brazil and is devoted to ensemble playing —from duos to chamber orchestras— and to contributing to the dissemination of contemporary music, particularly that of the “Neapolitan School”. He has given several world premiere performances of guitar works composed especially for him and has recorded for Italian, Vatican, Dutch and Brazilian radio and television. ...the demotion of the city that had just a century earlier been one of the most important European capitals, a cultural and technological center second only to Paris, led to an artistic channeling that expressed itself in song. It was a true cry of pain and an important bit of anthropological testimony—this attempt, sometimes ingenuous, to save the lost identity of an entire people that had collapsed upon itself [...] This explains why Neapolitan songs in the fifty years from 1880 to 1930 reflect the most varied and socially mixed origins. They range from songs by erudite poets and music scholars to poor, unknown and illiterate rhymers and street and tavern musicians. We see here once more this intersection of social classes that is so often characteristic of the history of Naples. In any case, the results were often excellent and even outstanding in their irrepressible creativity that was at the same time meaningful... In the songs of the 1800s, for example, we hear echoes, at various levels of our consciousness, of the heritage of one of the most solid and innovative schools of composition of the entire Baroque and, even earlier, of the late Renaissance. Nor should we overlook the determining role of radio and the invention of the phonograph and records. Tenor Enrico Caruso (Naples 1873 - 1921) was really the first one to try out this new technology, recording various operatic arias and Neapolitan songs in the early 1900s. His singing thus reached every corner of the planet to soothe the souls of millions of nostalgic emigrants on every continent, granting to Caruso a media fame previously unheard of. ...bombastic interpretations that in a certain sense deprived the songs of their aesthetic quality, in that they strayed from the original, more sincere domestic versions composed for voice and piano or plucked string instruments. Rather than the poetic chamber effect that bind verse and music together, Caruso aimed at amazing the public with his power and his ability to overpower a symphony orchestra, leading to the inevitable high-note conclusion. That is, perhaps, at the heart of Grande's rationale for releasing this edition—not to disparage the “bombastic interpretations” but if all you have ever heard of the Neapolitan song is the overpowering voice of Caruso or the Three Tenors or, recently, il Volo, then you are not getting the whole story. ...these works take their rightful place alongside the German lieder or Italian chamber music of the latter half of the 1800s. Pianist and teacher, Vincenzo Vitale, accurately observed that the well-known composer of the Neapolitan Song "does not hide behind the false modesty that was necessary for the Italian salon romanza". To a good degree, the Neapolitan song, indeed, had that salon kind of refinement of style, but in sentiment and subject matter, it was of the people. Popular elements were simply inserted into urban settings. It is not until the second half of the 1900s that we are able once again to hear intimate versions of the Neapolitan song, performed delicately, almost ascetically. This revival of the original spirit of the music is no doubt the merit of the duo of singer Roberto Murolo (Naples 1912 - 2003) and guitarist Eduardo Caliendo (Naples 1922 - 1993); both were born into the music and both had a profound knowledge of Parthenopean habits and customs, thus providing perhaps instinctively a true rebirth of the genre. The clarity of intoned diction combined with light chords appropriate to the guitar traced a new interpretative path, freeing the repertoire from the excessive trappings built up over time—often in bad taste. 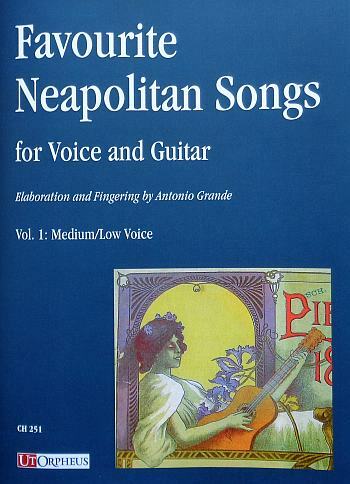 That is what this edition is really about: “intimate versions of the Neapolitan song performed delicately, almost ascetically” in the spirit of Roberto Murolo and some others. (There are on this website some brief recorded excerpts from Murolo's A Chronological Anthology of the Parthenopean Song from 1200 to 1962 at this link). With due respect to those who have gone before, and after more than 20 years of scholarly research and intense concert and recording activity, we cautiously put forward our readings of these timeless masterpieces for those who are interested in approaching the song/guitar interpretations of these most representative Neapolitan songs of the late 1800s...we have tried to find the path of synthesis and conciseness: an uninterrupted and equal dialogue between a single voice and a single instrument, using the instrument—in keeping with the lesson given us by Hector Berlioz—as a small orchestra across its entire range of expression. And I have barely touched the Preface. Really. Antonio Grande and I had a common friend in the late Mark Weir, who passed away in 2015. The volume is dedicated to him. Mark and I translated the Preface, and Mark contributed the translation of Grande's very informative notes on the songs themselves—the stories behind the music, so to speak. Indeed, it is—alas and sigh!—the case that Come back to Surriento [sic - it's the Neapolitan spelling], this beautiful and inspired love song, was written to mark the visit to Sorrento by minister Giuseppe Zanardelli to lobby for the opening of a post office. Era de maggio – Serenata napulitana – Autunno – Marecchiare. The texts are in the original Neapolitan presented with English translations, as well. All these songs—performed by the Duo minimo Ensemble (Daniela del Monaco, voice, and Antonio Grande, guitar) —have been presented in hundreds of public performances and feature on the following CDs: 1) Napoli in Canto - Opus 111 30-268 Paris, 1999 /reissue, Naïve op 30459 Paris, 2007; 2) Bellavista - CNI – Ut Orpheus Cndl 26847 – Rome/Bologne, 2013. 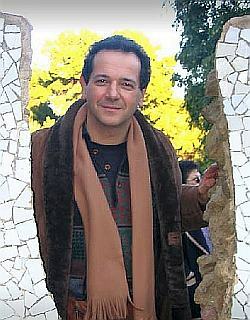 Antonio Grande has a google page with a number of videos at this link. ©2017 Ut Orpheus Edizioni S.r.l.